"Bright" doesn't necessarily mean "not dark" in Max Payne 3. 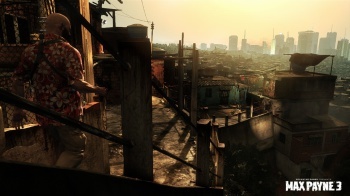 The South American setting for Max Payne 3 may be a little bit brighter than the previous games in the season, but Rockstar promises that, despite all the sunshine, the game will be as "noir" as either of its predecessors. Jernoimo Barrera, Rockstars VP of product development, said that noir was about more than just location, and that the game's sunny Sao Paulo setting didn't mean that Rockstar was abandoning what the Max Payne games were about. "We aren't moving away from those styles and techniques at all," he said. "And we've come up with what we think is an interesting interpretation of classic noir." Barrera explained that the reason that there was sunshine at all was that, unlike previous games in the series where the action had taken place over a single night, Max Payne 3's story unfolded over the course of several weeks. He also said that, while Sao Paulo might seem a bright and cheerful place during the day, at night it was a different matter entirely and promised that there would be "enough rain-sodden, pitch-dark nights in the game to satisfy the most ardent fan of dark and wet locations." Max Payne 3 comes out for PC, PS3, and Xbox 360 in March.